Located near la Forêt Fouesnan and Concarneau in the Finistère part of Brittany within walking distance of shops in the village centre and just a short drive from the beach Villas du Monde invites you to take your next holiday in this beautiful villa with private heated swimming pool. The ground floor has a very large light and airy living and dining room 65 m² which opens to the pool area and garden via five patio doors. Open plan fully-equipped kitchen with rear pantry, Nespresso coffee maker, chip maker and all the appliances that you have at home. Double bedroom (160 x 200 cm bed) and another double bedroom (140 x 190 cm bed) along with a shower room and toilet. The ground floor is suitable for reduced mobility. The upper floor has a blue double bedroom (160 x 200 cm bed) and a green double bedroom (140 c 190 cm bed). An orange triple bedroom (140 x 190 bed and 90 x 190 bed). Red triple with bunks bedroom (two 90 x 190 cm bunk beds and a single 90 x 190 cm bed) which is best for children. Bathroom and a shower room with toilet. Gallery with billiards, table football sitting area and kitchenette. The house is particularly spacious inside as well as comfortable and pleasant, there are four satellite televisions and a DVD player as well as baby equipment, ideal for a successful holiday. Set in a good sized enclosed garden covering 1500 m² with electric gates and video surveillance system. Superb ten-metre-long private swimming pool with a retractable electric security cover, heated to 26/27 degrees from the end of May. Boules area and two bicycles available. Garage. You can walk to the shops, pizzeria, creperie and restaurant in the village of Saint Yvi in around five minutes. Supermarket in Rosposden 8 km. Quimper 14 km. 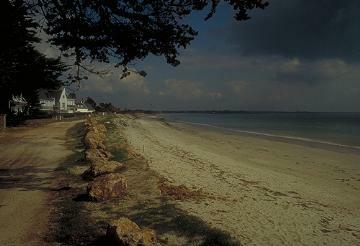 Beach at Foret Fouesnant 7.5 km. NOTE: Minimum 2-week rentals from the end of the first week of July to the end of August. Linen, sheets and towels Final cleaning. The heating of the pool. The deposit of 1000 euros Tourist tax of 0.45 euros per person over the age of 18 to pay on the spot.